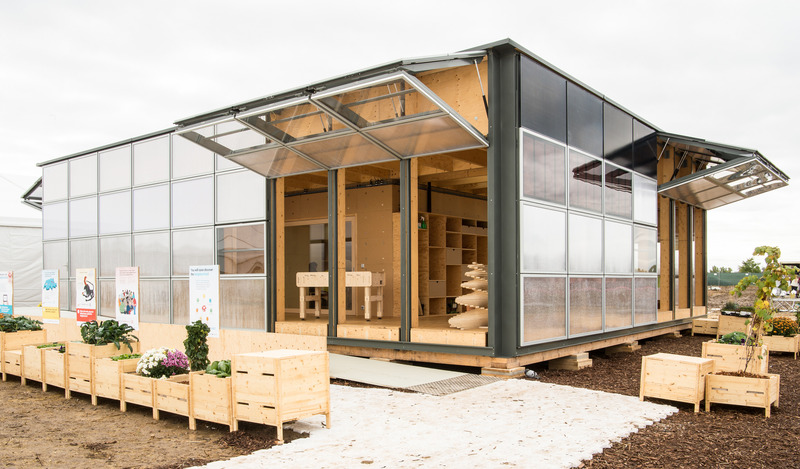 NeighborHub, designed by the École Polytechnique Fédérale de Lausanne, School of Engineering and Architecture Fribourg, Geneva University of Art and Design, and the University of Fribourg (Swiss Team), placed first overall at the U.S. Department of Energy 2017 Solar Decathlon. The team earned first place in more than half of the individual contests: Architecture, Engineering, Water, Health & Comfort, Home Life, and Energy. After the Solar Decathlon, NeighborHub was rebuilt in Fribourg, Switzerland, on the blueFACTORY site. “The house has now the function it was designed for: To be a hub for the blueFACTORY district and the people around,” says Samuel Cotture, student project manager. You can find information about the use of the house, such as research and events, on its website: http://www.neighborhub.ch/, which will soon be translated into other languages. Public Tours: Yes. Contact the team at https://www.bluefactory.ch/contact.